Having grown up in West Seattle, I am very familiar with the skyline of my beautiful city – I was lucky enough to live where we had a view of downtown. Over the years, I’ve watched the city mature – building taller buildings, adding attractions like the Seattle Great Wheel on the waterfront, and now the removal of the viaduct for a tunnel. But for all the change, some things have stayed comfortingly consistent; like the Smith Tower. 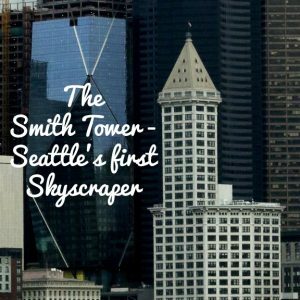 In 1909, Lyman Cornelius (LC) Smith came to Seattle, looking for a place to build a skyscraper. LC made his fortune selling typewriters and firearms in New York, but his wife had fallen in love with our great city on a previous trip and convinced him to build here. He purchased the land at 2nd and Yesler and began plans for a 14-story building. His son Burns suggested that he should build something much taller, to steal the title of “tallest building West of the Mississippi” from Tacoma – so he did. Construction began in 1911 and was completed in 1914, opening to the public on July 4th. It towered above everything around it, measuring an impressive (for that time) 469 feet, and over 4,000 Seattleites road the Otis Elevator up to the 35th floor to observe the amazing 360-degree view of the Puget Sound. Unfortunately, LC died in 1910 and did not get to see his tower. But I think he would have been proud! It kept the ‘tallest building West of the Mississippi’ title until the building of the Kansas City Power & Light Building in 1935 and remained the tallest building in Seattle (and the entire West Coast!) until the Space Needle was built in 1962. A couple of fun facts: the architectural firm Gaggin & Gaggin from New York was selected to design LC’s tower, even though they had never worked on a building taller than 5 stories. It was their first and last skyscraper. And in the 35-floor Observatory sits the “Wishing Chair” gifted to Smith by China’s Empress Dowager Cixi before she died in 1908. Rumor has it that if you are single and sit in it, you will be planning your wedding within a year! The ground floor of the building has a gift shop as well as historic exhibits that tell the history of the building. At the top floor of the tower is an Observatory with an open-air observation deck and 360-degree views of downtown Seattle, the Puget Sound, and the Olympic Mountains. If the sky is clear, to the Southwest you will be able to see Mt. Rainier, the tallest mountain in Washington state. While up there you can enjoy craft cocktails and seasonal appetizers in the bar, and if barrel-aged liquors are your thing, they make their own in house! Sip on a classic Manhattan or Old Fashioned while learning the colorful history of Prohibition in Seattle. The Smith Tower Observatory and bar is open Sunday – Wednesday from 10 a.m. to 11 p.m. and Thursday – Saturday from 10 a.m. – midnight. They offer two different tours, The Legends of the Smith Tower before 9 pm and Straight Up By Night from 9 pm – 11 pm. Tickets for the Legends tour are available online and are $20 for adults and $16 for Military/Student and children aged 5 – 12 years. Tickets for the later tour are $12 and can only be purchased in the Main Lobby. They also offer tickets for $10 during their Weekday Happy Hour, Tuesday – Thursday from 4 pm – 6 pm. Pro Tip: Buy your tickets for the Legends tour in the Main Lobby day of and you will pay the Locals rate of $12! If you are looking for accommodations in Seattle, consider booking one of our vacation homes. We offer rentals in the heart of downtown Seattle, many of them within walking distance of the Smith Tower, as well as in some of the city’s best neighborhoods. All of our rentals are updated homes with modern decor, high thread count linens, and high-quality appliances. Make breakfast and some coffee in your kitchen and then step out on your private balcony for stunning views of the mountains, Puget Sound, or downtown Seattle. For more information on our vacation homes or to book a rental, please contact us today and we will help you find the perfect home.